Visit the Construction Notices tab for the latest information on construction. The Mid-Coast Trolley will extend Trolley service from Santa Fe Depot in Downtown San Diego to the University City community, serving major activity centers such as Old Town, UC San Diego, and Westfield UTC. Mid-Coast Trolley construction began in fall 2016 and service is anticipated to begin in late 2021. Freeways and arterials in the Mid-Coast Corridor are generally congested and traffic congestion is projected to increase as the region grows. Population in the entire corridor is forecasted to increase 19 percent and employment is forecasted to increase 12 percent by the year 2030. 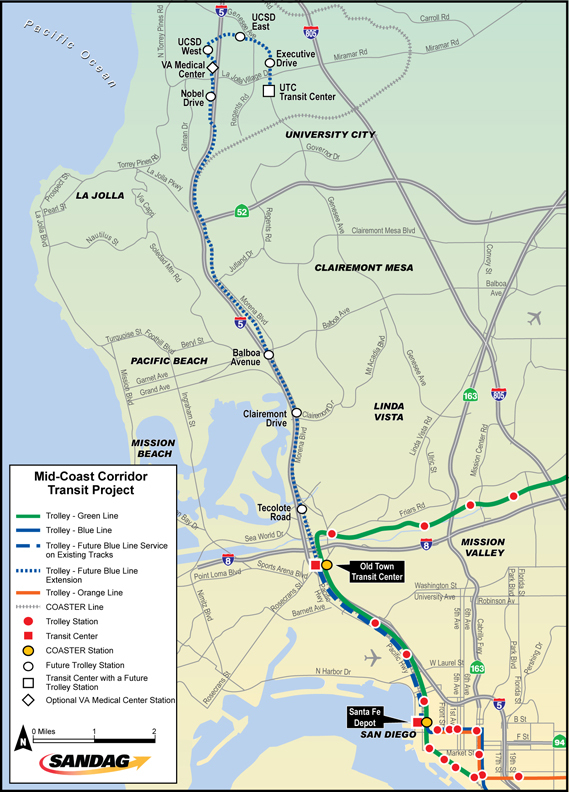 The Mid-Coast Trolley extension will expand transportation capacity in the corridor to accommodate existing and future travel demand, particularly for peak period commute trips. The Mid-Coast Trolley will provide an effective alternative to congested freeways and roadways for travelers and will reduce vehicle miles traveled. View a "flyover" of the Mid-Coast Trolley route. The Mid-Coast Trolley extension route begins just north of the Old Town Transit Center and travels in existing railroad right-of-way and alongside I-5 to Gilman Drive. It crosses to the west side of I-5 just south of Nobel Drive and continues on to serve the heart of the UC San Diego campus. It then crosses back to the east side of I-5 near Voigt Drive to serve the UC San Diego east campus and Scripps Memorial Hospital, transitions into the median of Genesee Avenue, and continues down Genesee Avenue to the Westfield UTC Transit Center. View simulations of each station. The project will connect corridor residents with other Trolley lines serving Mission Valley, East County, and South County. 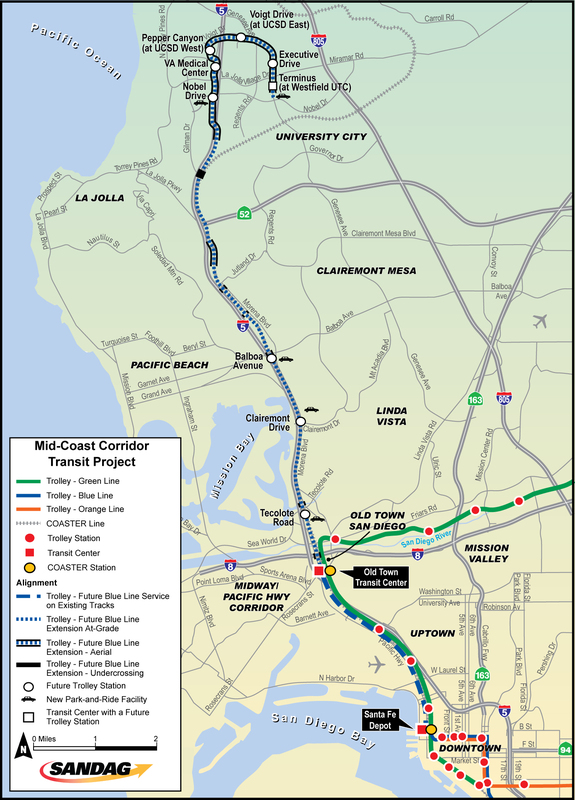 As an extension of the existing Metropolitan Transit System Trolley Blue Line, the Mid-Coast Trolley will offer a one-seat (no transfer) ride from the international border and communities south of Downtown San Diego all the way to University City. This new service will enhance direct public access to other regional activity centers and improve travel options to employment, education, medical, and retail centers for corridor residents, commuters, and visitors. View this project's fact sheet in English and en Español. In the Mid-Coast Corridor, mobility hubs will serve to enhance access and connections to the Mid-Coast Trolley, making it easier to use public transit and other travel alternatives. Mobility hubs offer an array of transportation services, amenities, and urban design enhancements that connect transit to where people live, work, and play. Various modes of travel, including walking, biking, ridesharing, shuttle, bus, and light rail services come together to create a seamless travel experience. Supporting technologies such as real-time arrival information, electric vehicle charging stations, and mobile applications also improve convenience for users. The Mid-Coast Mobility Hub Implementation Strategy will identify services and amenities for each station which may include improved pedestrian and bike connections, secure bike storage, on-demand ridesharing services, wayfinding, and supporting technologies. The strategy will also outline steps needed to implement recommended mobility hub improvements at Mid-Coast Trolley stations. The project also includes opportunities for community input to guide development of mobility hub recommendations. To learn more, visit SDForward.com/MidCoastMobilityHubs.